According to many westerners, this place is also recommended in their books. Recommendation: Visit this place with at least two people, as two can share one order. You can always order more if you are still hungry. Diana and Stefan did not take my advice, for they were "hungry." They regreted it. One order is VND5,5000. 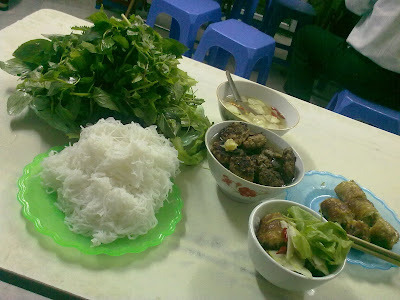 Comes with a pile of dry noodle (meng), a HUGE pile of greens, a bowl of BBQ pork, and a plate of spring rolls. As I sat there busy stuffing my face, came Diana and Stefan. For a moment, they thought I was the boss. My crapy German only got me as far as asking them whether they were Germans or Austrians. I did not understand Diana's praise on finding her accent was not pure German. So we switched to English. She is Polish. Another "Dzien dorbry" threw my plan on finding Polish assholes out of the window. They were so friendly that they invited me to join their table. It turned out that we ended up in this joint because recommendations in our guide books. They heard although Lonely Planet was good, however, Rough Guide is better in this particular case of Vietnam. This happy couple are engaged. All the best to them.